Some of you eagle eyed readers might remember that a while ago we told you about a sneaky rumour which involved Sonic Colours and a 2 player mode. Well I’m here to tell you, that you haven’t gone insane just yet, and yes Sonic Colours will have a co-op mode! The mode itself will be set up as Robotniks robots trying out a simulation. You can unlock co-op stages through the main game by collecting all the red medallions scattered around. Also the co-op stages are supposed to be hard. Even more difficult than the main game. Sounds fun, I hope it has an online mode, but really with the Wii I doubt it. Oh well, we can still grab a ‘real life’ friend and have some fun when Sonic Colours comes out later this year. 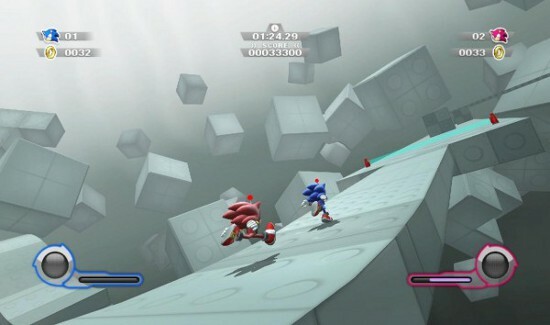 So does the fact that this is a simulation mean that the red recolour of Sonic isn’t going to be placeholder then?